When the Lewis and Clark Expedition to the Pacific Ocean went through this area their mood was undoubtedly gloomy. On the previous day they had buried their comrade, Sergeant Charles Floyd, who died of a ruptured appendix. Although he was the expedition's only fatality, the explorers suffered from a variety of illnesses and accidents. On August 22 Captain Lewis became ill. Although the cause is unknown, Captain Clark mistakenly believed it was caused by arsenic in rocks Lewis had examined. On the return journey in 1806, Lewis was injured in a hunting accident. On this day the explorers passed the Sioux River. Clark was told about a place high up this river where "a Creek Coms in which passes thro Clifts of red rock which the Indians make pipes of, and when the different nations Meet at those queries all is piece." This is now known as Pipestone National Monument, located in southwestern Minnesota. The party camped along the Missouri River northeast of here. 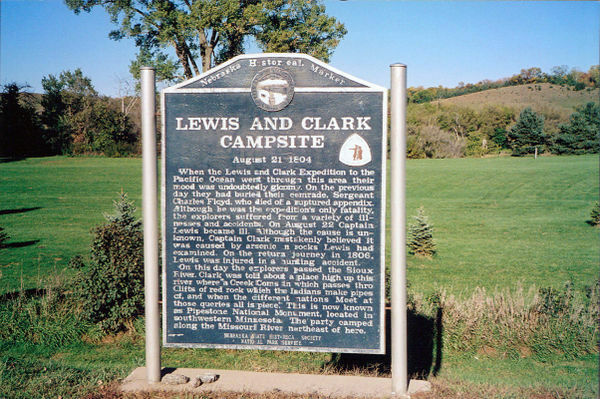 “Lewis and Clark Camp Site: Aug 21, 1804,” Explore Nebraska History, accessed April 19, 2019, https://mynehistory.com/items/show/109.